Studying abroad for one year at two separate institutions on two continents has been and will be exhausting but beautiful. The decision you made to spend two semesters in two separate locations was not taken lightly. After two years at BCB, you probably did know everyone and had taken classes across several concentrations; it was normal that you felt a little restless. You and most of your friends consequently decided to study abroad at BGIA, CEU, Bard, Lingnan, Sciences Po — and for two semesters instead of just one. Silly as it may seem, if you were considering spending those two semesters at two institutions, you realized it would be a good idea to come up with a kurz und knackig (short and sweet) introduction to your life. Even before coming to upstate New York, you’d been asked which state in the US you were from countless times. So your spiel was to establish that you were a German-but-international student from an undergraduate program at Bard College Berlin who has lived in places like Bangladesh and Georgia, yet always ended up at English-speaking international schools where picking up an American accent proved to be surprisingly easy (and franky unavoidable). Your time at Bard during the Fall Semester began with an unexciting eleven-hour layover in Dublin, one that was made even more unpleasant than usual by the cold you had caught just twelve hours before your flight. After that fiasco of an airport experience, you would not recommend that particular AerLingus connection to future study abroad students. Thankfully, things definitely picked up for you from there. Insider information about airlines or cafeteria food is something you’ve always appreciated in reflections about academic experiences when making big decisions, such as where to go to college or study abroad. You hope that your reflection, through the sharing of some of your unprofessional opinions on Bard and CEU, might be helpful to others in the middle of filling out their study abroad forms. Firstly, Bard kind of is in the middle of nowhere and, while there are more than a few things to see in the area, this will be one of those semesters when you will be forced to focus on your academics… but you will end up liking it! Whether that means that you’ll join one of the many clubs, visit the career development office (repeatedly) or simply take advantage of the world-class professors, you will always find something to do. To fellow EPST (Economics, Politics and Social Thought) students: Bard has a terrific economics program and political studies classes that will turn just about anyone away from their major and towards politics. What you found great about the political studies classes is the faculty of experts — in your course on the international relations of the Middle East and North Africa-region taught by Jim Ketterer, you and your classmates were frequently visited by Jim’s former colleagues and acquaintances, who were diplomats or policy experts of the region. What most appealed to you about Bard was probably the heterodox economics program, which teaches a wide array of theories, including the more mainstream approach. The fact that you got a glimpse of an ideologically differing approach — namely, post-Keynesian Modern Money Theory — was invaluable to you and certainly would be to any EPST student. Moreover, taking classes about the international relations or history of different parts of the world provided you with some of the diversity that a small institution like BCB cannot. Since most exchange students live on campus, the potential for academic achievement is high; you have a meal plan that feeds you three meals a day and a quiet campus environment to help you focus on school. There is still plenty of temptation with New York City just a few hours away from Bard, but the food prices do quite a bit to counteract the desire to abandon your work for a weekend and take a trip to the city. In contrast to the New York skyscrapers, the Bard campus seems more scenic to you than Central Park will ever be. Trees, open fields, luscious gardens, and gorgeous sunsets abound. This idyllic imagery aside, you feel compelled to point out that Bard urges study abroad students to live on campus and provides no resources to help you live off campus. For those considering a study abroad at Bard while living off campus, it may be prudent to look into options early and try to join Facebook groups for people exchanging information about that. While you truly loved living on campus, the costs were still significantly higher than paying for an affordable room in a WG in Berlin, and no matter the picturesque scenery or the comfort of having your friends around, you would have liked to experience the feeling of being a “towney” in Red Hook or Tivoli. All in all, the Bard bubble is an eclectic one to burst into in the middle of your college career. The student body is just big enough for many, well-defined cliques to have formed, and too small to have a lot of people floating between these cliques. This means that it is easy to get lost as a study abroad student, which makes you feel very lucky that you didn’t. One thing that really helped you was joining the Bard Debate Union (one of the many clubs on campus that welcome you with open arms), so you could feel like you were able to engage with the student body in a meaningful way. You were certainly busy in the best of ways. You took road trips near and far (to Target in Kingston or to Virginia for Thanksgiving), you went to on-campus events, travelled for debate, and spent way too much on toiletries. Sadly, one time you ended up being busy in a way that could in no way be categorized as good or fun. You contracted a whooping cough, had to make your way to Albany to seek out a specialized clinic that treated people with your medical condition, and you were quarantined for five days. But, then again, what’s life without a little excitement? Four months, at least 70 cappuccinos from the drive-through Dunkin’ Donuts, dozens of sunsets shared with friends and a whooping cough later, you took a flight back to Europe — this time an enjoyable one. Now attending Central European University, especially after a more secluded place like Bard, was a welcome challenge in that you were suddenly expected to stand on your own feet a lot more — with less help from the administration — while also being surrounded by some of the most helpful people you’ve ever met. The transition from Bard to CEU was a tough one because you had what felt like two and a half days to celebrate Christmas and New Year’s, hug your family, repack, and make your way to the next adventure. Before you knew it, you were walking by the St. Stephen’s Basilica every day and starting your next batch of classes with a whole new set of professors and classmates. A huge plus is that you really stuck out like a sore thumb in the best way possible. Students at CEU mostly take classes with the 50-70 others in their specific program, so when you arrived they noticed that you were the only person in the room they haven’t had a class with. It is more than heartwarming when graduate students who are a little older than you actively take interest in newcomers like you by asking who you are, what you are doing, and if you need any help. At CEU, you are now taking classes with people who have spent five years working in their fields after doing their BA and MA and are now completing their second Masters degrees. Of course, there are also those who recently finished their undergrads and immediately moved on to grad school. You heard a student that fits into the latter category explain that they went straight to grad school “because they didn’t know what they wanted to do yet”. You currently feel the same way, which is exactly why you won’t be going to grad school right after graduating from BCB. The conversations with these CEU students, even just the initial exchange of basic details and life events, are like getting a glimpse of the future before you’ve had to decide how you’re going to create it. And then there is the added bonus of going to school in a European capital like Budapest: Food is cheap and student discounts abound! There is always something to do, be it a talk at CEU, a live music event at Szimpla Kert, or a new cafe or restaurant to check out. A side note: Budapest causes you to turn into a cheap food snob who will pass up any restaurant that charges more than 6 euros for a meal. You don’t think it’s the worst thing, but it could be tricky to handle next time you’re charged 20 dollars for a drink and a meal in an American diner. And then there’s the city itself, with all of its economic and political realities, that you cannot ignore. Budapest: a multi-faceted city with gorgeous, posh neighborhoods like the one CEU is situated in, but also dirty, run-down streets with closed-down shops and battered apartment buildings. Hungary receives a great deal of financial support from the European Union, but still it’s evident that many people have felt the economic stress of the last decade. It’s not hard to see why populist politicians like Viktor Orban are appealing to Hungarians here in Budapest, let alone those in poorer, rural areas. No matter how disheartening, you are glad that you get to physically interact with a space that reflects the political landscape of a country that you are not as familiar with — something that the Bard campus clearly is not. To students considering a path like the one you’ve taken, you want to stress the importance of the variety provided in different ways by institutions like CEU and Bard. 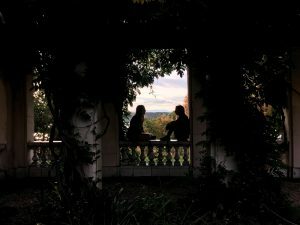 The depth and breadth of experience you’ve gained through your study abroad experience cannot be adequately described in words alone; some lessons are best learned outside the classroom. This is not to say that you do not value your home institution: The opposite is true. You would like to end with a comparison you thought of after taking a class on Asian Economic History at Bard. In the 20th century, countries like Japan and South Korea developed quickly compared to Thailand, a resource-abundant country, because the limits of their resources (like land) forced them to innovate technologically and think outside the box. At BCB, certain resources may seem to be in limited supply, but that means that by making maximal use of them (whether this be by studying abroad or through other channels) you and your peers can thrive just as students with abundant resources at their disposal would. One must recognize the quality of the resources BCB has available in order to appreciate them fully and take advantage of them properly — the patience and helpfulness of professors and faculty, the energy and enthusiasm of the Student Life Office, and the accessibility of travel opportunities come to mind. You are looking forward to getting back to this institution whose resources you feel you’re taking full advantage of. It seems that feeling restless after two years at BCB wasn’t the worst thing; it seems like you’ve gotten and keep getting a lot out of it. Living out of a suitcase for a year might not have been the most comfortable of situations, but so far you’re finding it more than worthwhile.